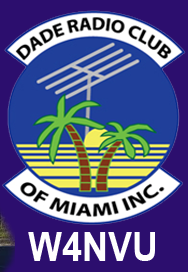 July 2011 Meeting Minutes – W4NVU – Dade Radio Club of Miami Inc.
Meeting was called to order at 19:40 with 21 present. Miguel presided over the meeting and welcomed everyone. Everyone took turns and stated their name and call sign. Miguel welcomed everyone again. We have a quorum. Miguel reminded everyone present tonight to sign in. The minutes were posted and read from March 2011; April 2011; May 2011 and June 2011. They were all accepted. Joanne, our secretary, is not present tonight as her husband is in the hospital. Corresponding Secretary – Virgil – he goes to the mailbox every Thursday. He wanted to know about membership cards to new members. Website is up and running and designed to be user friendly. All board members are allowed to put up items on the site. The new website is w4nvu.com. Ryan worked hard to make it and updated all the minutes into the new site. Ray said that UM is giving access to the top of the building to put the 220 so that it can run again. Robert has it. It needs to be tweaked on a bench to be put up. Miami-Dade Ares/Races Update for the month was given, as well as the Coral Gables Races Net information; the Everglades Amateur Radio Club Net and the Cutler Bay Races information. Field Day – Virgil attended and said that they had great food. They were in an air-conditioned building. They had stations all around. They contacted 250 people. Everybody had a good time. Miguel thanked the Everglades Amateur Radio Club for inviting DRC. By-Laws Committee – Virgin said that he is merging the DRC and the SFFMA By-Laws and is working diligently to finish. The October Picnic – Carl was going to find out about the park. Hamboree – Need a cheap location to hold it. Virgil is going to contact the Polish American Club. Vendor contact to get donations – Miguel said to give the spot on the web for prize donations. EARC Everglades Ham Radio Day is December 3 and 4th at the agricultural center. Armando Flores gave an informative presentation on Disaster Service Technology. Great presentation. Thank you Armando. Next month’s presentation will be by Bill William on Satellite Radio Transmissions. The DRC meeting was adjourned at 21:00.